Using density-functional theory calculations, we show that the electronic and magnetic properties of zigzag graphene nanoribbons (ZGNRs) are highly sensitive to large scale curvature. As the curvature increases, the system experiences a transformation from the antiferromagnetic state to a nonmagnetic state and then back to the antiferromagnetic state. The energy gap first remains almost invariant and then decreases monotonically. The results demonstrate a facile strategy to tune the electronic and magnetic properties of ZGNRs, and furthermore provide an avenue to design versatile electronic and spin devices.VC 2012 American Institute of Physics. The spin-polarized energy gap of the curved ZGNR as a function of the bending angle h. The upward triangle represents the AFM ground state, and the downward triangle denotes the NM ground state. (a)Band structure of 88°-ZGNR. (b) The electron density slice through the C1 and C2 atoms. (c) Charge densities of the LCB. The isovalue is set to 0.005 e/Å3 (a) Spin-polarized band structure for the AFM ground state of 89°-ZGNR. (b) and (c) Charge densities of the LCB for the spin-up states and spin-down states, respectively. The isovalue is set to 0.01 e/Å3. Via molecular dynamics simulations, employing aforementioned mechanism, we presented a conceptual design of nanoballista based on CNTs which contained a fullerene. As shown in Figure 1(a), a small portion of a (5, 5) carbon nanotube was previously twisted though rotating atoms fixed in region L1 and L2 (colored in green), and then optimized to obtain reasonable geometrics. The nozzle of the tube (colored in green) was also fixed to avoid the energy dissipation and maintain the stabilization of motion direction of the C60. Then, the restrains on the atoms in region L2 were removed. For the fact that the torsional strain energy were concentrated in the left section of tube, the stress gradient along the longitude direction started a stress wave which boosted the C60, as depicted in Figure 1(b) and (c). 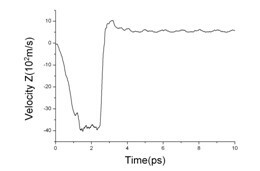 As can be seen in Figure 2, the muzzle velocity of C60 could be up to 4 km/s (about twelve times of sound velocity). The graphene sheet was introduced as a bulletproof membrane to stop bullet from passing through it. The graphene sheet absorbed collision energy by bending and emitted a transverse deflection wave propagating in the sp­2 bond network. It should be noted that the instantaneous impact pressure of the contact region was calculated to be in the range of 1-10 GPa (see Figure 3). Finally, the fullerene was rebounded by the graphene sheet. Furthermore, the relationship between temperature and impact pressure was investigated. Fig 1. Snapshots of the emission of C60 at different time points. Fig 2. 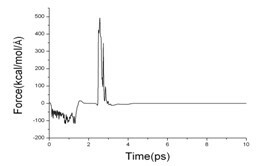 Mean mass velocity of C60 against time.